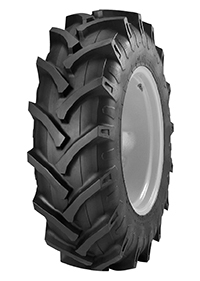 The special lug shape, which gradually widens toward the central tread zone, provides high resistance to gougings and lacerations and delivers even wear on both road and field. The TM190 is suitable for most operations and types of terrain, giving top performances in applications that involve a high level of road and field use, whether on normal cultivated terrain or hard, stony grounds. The reduced height of its lugs makes it an especially good performer on grassland.